I really like some of the pillows that were found. 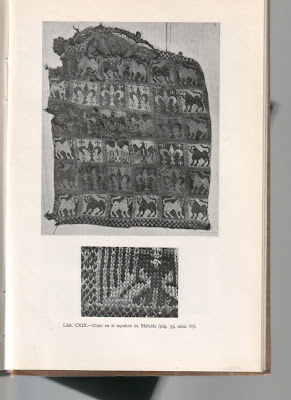 In the book, these pillows were included in the chapter on embroidery, but they were described as follows: “Una segunda categoria, dificil de rastrear en sus origenes, es el punto de media, hecho con agujas, sin base alguna que recuerde el tejido” (p. 84). According to this description, they were made with the technique “punto de media, hecho con agujas”, which is some kind of crochet or knitting, made with needles. Hmm.. what would that mean... I don't really understand this part either: “sin base alguna que recuerde el tejido”. Does it mean that the pillows do not have a base that ressembles woven textiles? If it is somehow crocheted or knitted, that is quite logical. 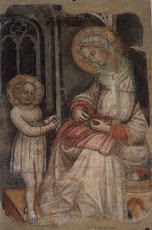 In addition, the author says that is is difficult to trace the origin of this technique, and the pillows were probably made in Andalucia. These purses are so beautiful! There are also some with horiontal rows of flowers in red, blue and yellow (on top of my wishlist of “Things I'd love to try to make one day”). 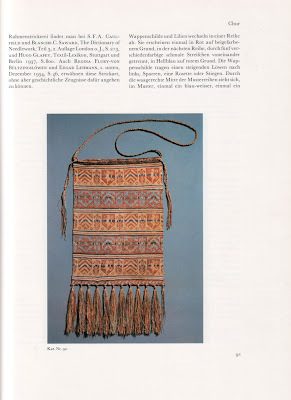 Maybe it's not possible to compare objects from such different times and places, but I do wonder whether similar techniques were used to make the pillows and the purses. If you know more about this technique, please let me know!